NYC Smile Design - BLOG - What Do You Do if Your Teeth Have suffered from Bruxism? In a previous blog, we wrote about Bruxism and the damaging affects it can have on your teeth. In our office we see a lot of patients who have suffered from Bruxism. Depending on how severe, and the duration of the grinding the damage done to your teeth would need a customized treatment. Below we will highlight some of the different cases that we have had over the years describing the process we went through to restore their smiles. When small problems are neglected over time, they can become very big -- and that's just what happened to Kirsten. For 15 years she had suffered from increasing jaw pain and clicking because of the severe erosion of her teeth. They seemed to be almost melting away in front of her eyes and, when she came to see us, she realized that almost half of her original tooth volume had been worn away as a result of her acid reflux. After it was brought under control, we observed that Kirsten also showed excessive gum when she smiled. To reduce her gummy smile, we suggested a laser gum lift, and then determined the best way to repair her misaligned jaws and eroded teeth. A thorough study of her joints determined how her teeth should meet correctly (in order to relieve her pain), and the results were digitally recorded. We worked very precisely from the digital recording, preparing all 28 teeth to accept 28 porcelain restorations. The results were amazing: not only was Kirsten's longstanding jaw pain completely relieved, but her new smile was natural and perfectly proportioned. “It was truly a life-changing experience for me" said Kirsten, who now has a smile to be proud of. Erosion of enamel surface of teeth can be caused by EXTERNAL ACIDS such as drinking excessive acidic beverages ( carbonated beverages, lemon or orange juice), medications, environmental acids, swimmers who work out regularly in pools and occupational wine tasters. Erosion of teeth can also be caused by INTERNAL ACIDS, such as regurgitated gastric acids and excessive vomiting. Saliva’s buffering capacity can resist the changes in the acidity by neutralizing it. Due to varying factors the saliva can be overwhelmed by the acids and the enamel surface of the teeth may slowly erode away. Saif had mentioned to us that he has always been a heavy drinker of carbonated beverages since he was a child. More than likely this has contributed to Saif’s excessive tooth erosion by the age of 25 and that’s when he came to see us for a consult. 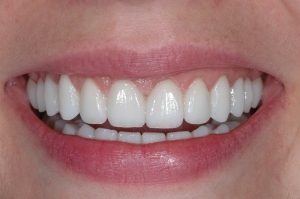 Our treatment for Saif was complete reconstruction with porcelain coverage on every tooth. Unfortunately there are no alternative treatment plans that can be proposed and if we were to do nothing the erosion of Saif’s teeth would continue as he had lost more that 50 percent of his enamel on some teeth which had exposed the underlying softer and sensitive dentin. A month after Saif’s reconstruction was completed his response was “I’m absolutely loving it and I haven’t stopped talking about it”. For a svelte and savvy former runway model in Germany, Elizabeth really understood how important first impressions and appearances were to her career. But, along with the glamour of her profession, there was always stress, and Elizabeth had begun grinding her teeth in response to it.She noticed that they were getting shorter and shorter, and eventually -- when friends and family noticed as well -- the progressive changes became a problem she wished to solve. Her general dentist, who performed routine dental work told her she needed fillings replaced and would require new crowns. But, deep down, she knew that more extensive repair was necessary. 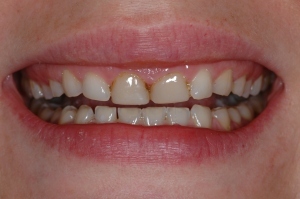 In a young patient, this level of tooth loss as a result of grinding may require aggressive treatment -- in their best interest -- to reach the best outcome. After discussing the options, we agreed to a full-mouth reconstruction: every tooth in her mouth needed to be restored with full-coverage porcelain crowns to provide a new biting surface, and to give Elizabeth a flawless, natural look that would complete her runway look. Her treatment took five months to complete, and also gave Elizabeth an appreciation of the importance of a healthy lifestyle. She is thrilled with her appearance, and has begun exercising on a regular basis. She even took up biking, and used her trips to our office during her treatment to enjoy her new exercise!